North and South Koreans are separated by a literal and symbolic divide, but a buzzing writing class in Seoul is helping to change that narrative. Mulmangcho Open School allows its students to overcome such binary divisions and write their own stories. It is the first time the non-profit education initiative has organized a session for both North and South Korean university students. The school is managed by non-profit organization Mulmangcho, which helps North Koreans settle inSouth Korea through education and publishing initiatives. By all accounts, the writing class is a resounding success. “I really enjoyed the writing sessions and for North Korean students like myself, writing is (a good way) to heal yourself,” says Kim Joo-young, 26, a North Korean engineering student. 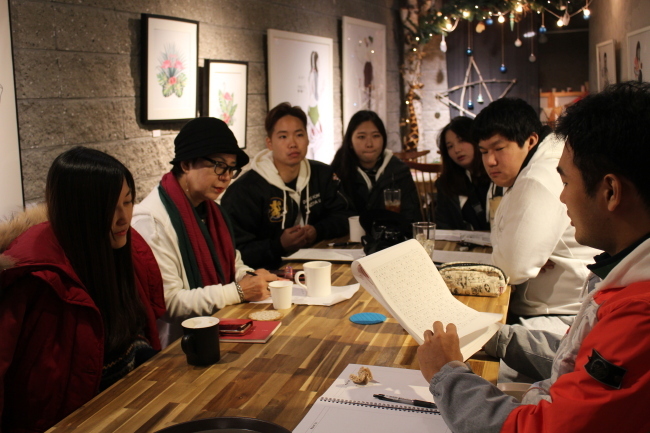 Each week, North and South Korean adolescents sit together with their teacher Park Kyung-Hee and discuss their story ideas. Weeks later, they have all penned a short story that will be published in an anthology titled “Nae An-e Soseoli Isseonne,“ which translates to ”There Was Inside Me, a Story“ in English, in late April. Kim tells The Korea Herald he prefers to be called the name of the protagonist in his short story, which is based on the three months of investigation he underwent when he came to South Korea three years ago. In his story, the protagonist Joo-young is a privileged North Korean student studying abroad in Austria, who then defects to the South. “I originally had the idea to write a story for myself, but it was much harder than expected. It was hard to even begin writing,” says Kim. Back in North Korea, Kim was also an engineering student, but he says the only difference in education was the restricted freedom of speech. Consequently, studies in literature and the humanities were directed towards the ideology of the regime. That is why he wanted to join the writing class -- because he wanted to experience diverse literature and it had a creative focus, which would help him tell his story and heal past wounds. ”I‘ve suffered from trauma because I left my family behind in North Korea,” he says. For Kim, it is a painful process that cannot entirely capture the depth of his experiences. But it is a means of self-therapy that he is glad to have found. For South Koreans like Kang Min-jun, 26, writing initiatives organized through Mulmangcho are an important step toward bridging the gap between North and South Koreans. The aspiring attorney said he joined the class because he wanted to write a short story on his own and connect with North Koreans. Kang says he learnt a lot about his northern counterparts. He said they were more articulate and outspoken than the South Korean students, who tended to be reluctant about sharing their honest thoughts. ”I realized that I wouldn‘t be able to tell if a person were a North Korean defector or not, unless that person told me,” he says. “Writing a novel is not an easy process,” says their teacher Park Kyung-Hee, who is also a writer, lecturer and former broadcaster. “When these students wrote their stories in the writing sessions and when they were editing their stories, I saw a lot of progress. 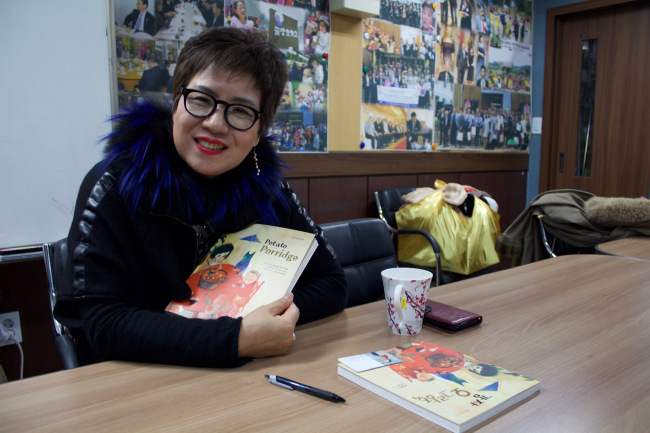 Park first worked with Mulmangcho on “Potato Porridge,” a children’s book she wrote based on the experiences of North Korean children following their settlement in South Korea. Her time as a reporter exposed her to the experience of North Korean students adjusting to school in the South. She found it was difficult to tell their stories because they scarcely opened up about their experiences. This became her main incentive to hold reading and writing classes for North Korean children. At Mulmangcho, it was her first time teaching North Korean college students, and she was struck by how hardworking they were. But she said they seemed to put limits on their own capacities. “I realized that North Korean students can be very different (...) and that there are many great students like (Joo-young). Since 2012, the Mulmangcho Open School has run two to three sessions per year for North Korean college students. International Coordinator Kim Dasol tells The Korea Herald that working with North Korean refugees has taught him to see them as individuals rather than the homogenous “defector” identity they are often ascribed. Because over 30,000 North Koreans have entered South Korea since 1998, Kim sees Mulmangcho as a significant organization. But he believes it is not enough to simply settle North Koreans, and helping them integrate into South Korean society is far more important. “I feel very happy when I work with North Korean refugee students or our staff, who are all (trying to create) a Korean society (without prejudice),” he says. Mulmangcho’s other initiatives include their alternative school for college preparation and the Blossom Project, in which they send North Korean students to study in the US for two months. Cho Yun-myung contributed to this report. -- Ed.